This bar contains 10% unsaponified (original state) Organic Olive Oil making it incredibly hydrating. You won't believe how soft you skin feels after washing with it. With only three ingredients (olive oil, water and naturally occurring glycerin) this is a perfect soap for those with very sensitive or dry skin. It is also great for use on babies. 100% natural and 100% organic. Suitable for all skin types. Usage: Dampen and use directly on skin or on a loofah. Ingredients: Organic Olea Europaea Fruit Oil, Aqua, Glycerin. Best face wash soap ever...and I use it all over too. Has a nice silky feel to it. My favourite soap!! Yes it is pricey, but I buy bulk when on sale. :) I use it for my face and body, and have had no issues. Soap is good, however since the bar is small and the pricepoint high - I likely won't purchase again. My new favourite soap and it has replaced all other body & face washes. I have sensitive skin & acne prone, and this soap doesn't cause any breakouts. 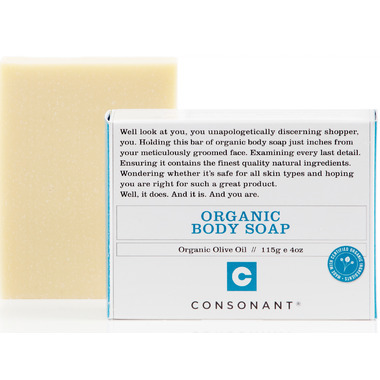 My sons, in their 20's, and I have been using Consonant Organic Olive Oil Body Soap for several years now, it's the only soap we'll use...it's simply the best! And the icing on the cake...it has the best rating possible on the Skin Deep database website, so it's super healthy! I have ridiculously sensitive skin and everything that I use, I react too!!! I tried this bar once on my face and did not have a reaction, as well as leaving my face very soft!!! 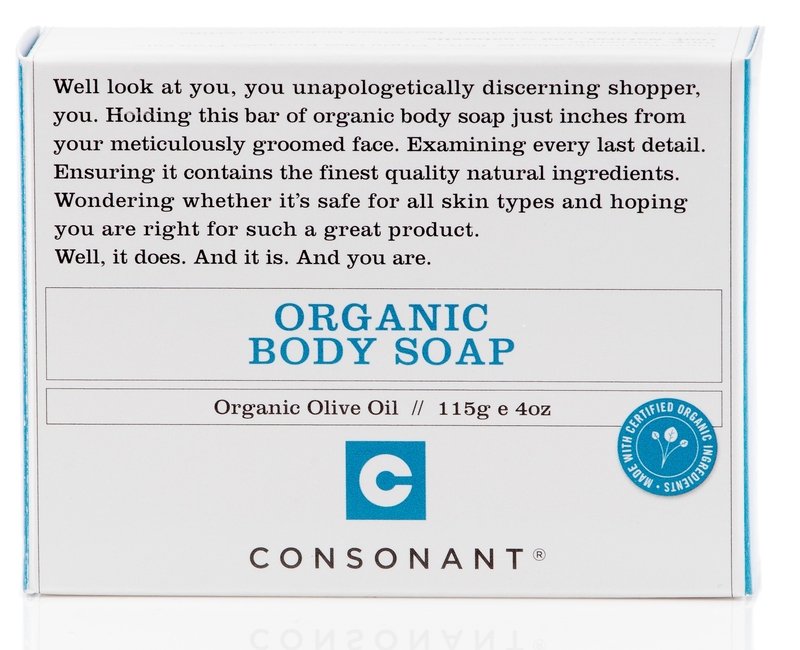 My husband now uses it and loves it, loves the fact that it is organic, 100% natural and unscented. This product makes your skin feel wonderful! Doesn't make your skin feel tight and is great for sensitive skin. Bar is a bit pricy and somewhat small, but is a great product!